“Oh gosh. What’s happening?” I questioned internally, keeping my demeanor as professional and unfazed as possible. Something was wrong with my camera. It wouldn’t focus. I was pressing the shutter button but it just wouldn’t focus. Then I realized that a photographer friend borrowed my camera and must have changed a setting. But who keeps their manuals on them at shoots? 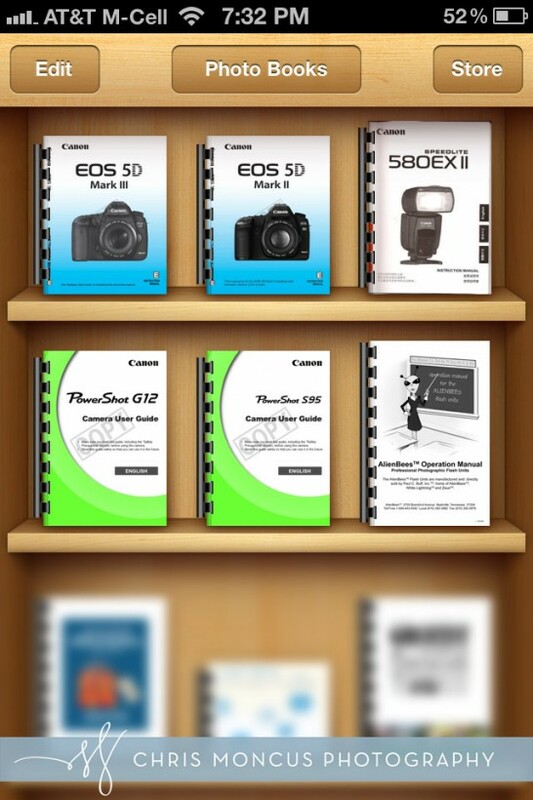 On my iPhone in iBooks I have a folder for photo books. Inside are the manuals for every camera and flash I own so that in case something like that ever happened I would have them readily available. My clients are worth the trouble of getting that together. They expect me to not only have fully working, professional equipment, but to also know how to fix it in case something quits working. A brief search turned up the section on turning off focussing on the shutter button. Once I turned it back on things were back to normal. The client never noticed. Her shoot was unaffected. A day saved by preparing for the worst. Since that happened 2 years ago I’ve only had to break the manual out on a shoot maybe one other time for a flash. I was so glad to have them then. So my tip for you is to go to your camera manufacturer’s website and download the manuals. Usually it’s easier to just Google “5D Mk III Manual” than it is to actually go the camera manufacturer’s website and navigate to it. 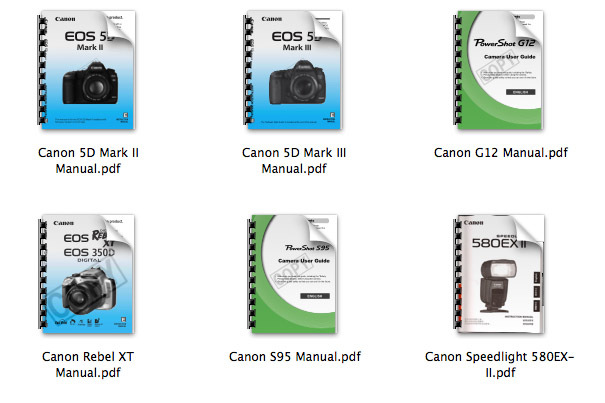 Once you have them all together, logically rename them like “Canon 5D Mark III Manual.pdf”. 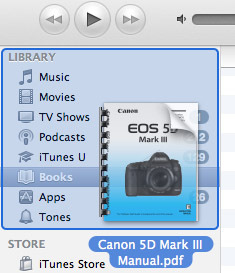 To add them to iTunes, drag the PDFs to the Library panel (top left of sidebar). Make sure they are renamed and have the same author (helps with sorting). 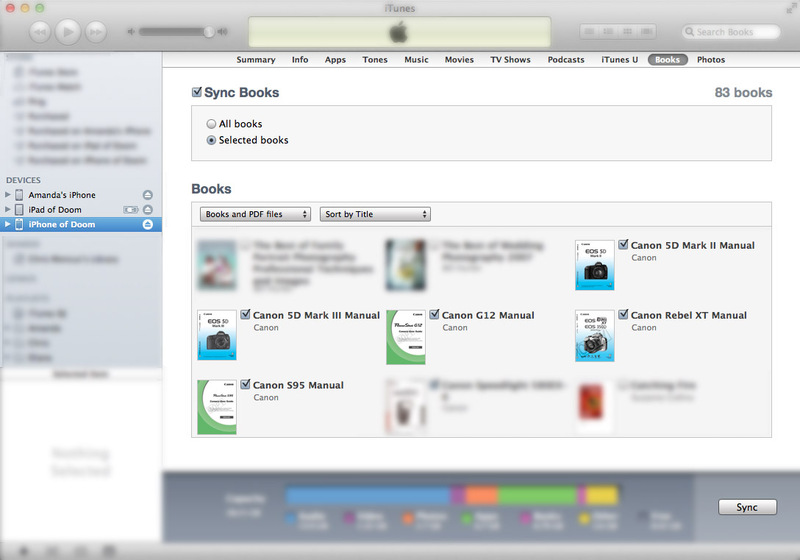 Then sync to the Books tab under your device (or do whatever you have to do on Android). I blurred out the unimportant parts. I even have my old Rebel manual for a camera I haven’t used in 5 years. Once you’re synced you should have your manuals on your iPhone or iPad – ready to save you if something goes awry in the field, at a wedding, or during a session. Hope this helps! Ask questions or leave comments below!